BZC-400ZYII truck mounted drilling rig is designed by our engineers; it adopts truck mounted and is a rotary drilling rig. ◎ The truck chassis adopts the 6X4 special crane chassis of brand SINOTRUK , the main transmit, transmission power, gearbox, sets of windlass, mud pump, sewage pump，mast are set up on the chassis. 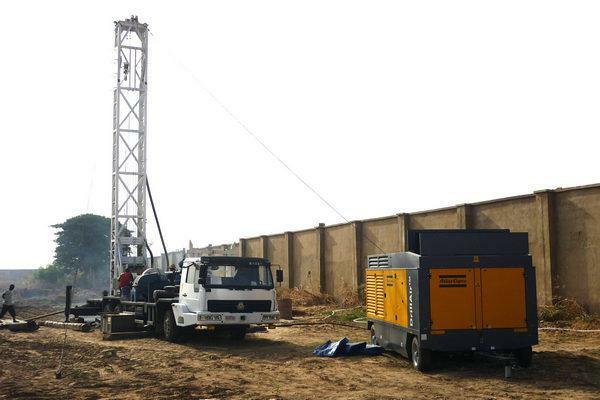 ◎ This rig is a rotary drilling rig with directional circulation, which is equipped with BW850/2A mud pump, It adopts the slurry as the washing fluid, it can drill on clay, sand and rock if it is equipped with a good drilling bit. ◎ The power of drilling rig comes from the truck engine, the rig setups distribute implement and hydraulic system. ◎ We can upset the spare electric engine and clutch implement according to client’s requirement, so that the rig can work with diesel engine or electric engine. ◎ We can set up a generator (15kw) , so that it is convenient to illuminate or work at night. ◎ The adding pressure device is hydraulic, so it has a high efficiency when the rig drill on mud rock and weathering formation through using the adding pressure implement. ◎ The master driving of rig is mechanical, the four jacks and mast are hydraulic operated. Distribute box, sewage pump, master driving clutch system are air operated. ◎ The appearance of rig is pretty, it has a high efficiency because of having a larger torque of the turntable, it is mainly used for water well, construction, national defense building foundation, geological exploration, geothermic well and other foundation working, it is popular with domestic and foreign clients.